The Tropical Forest Research Institute, Jabalpur is one of the eight regional institutes under the Indian Council of Forestry Research & Education, Dehradun. The Institute came into existence in April 1988, although its origin goes back to 1973 when a Regional Centre of Forest Research Institute, Dehradun was established at Jabalpur to provide research support to the problems of forest management in central India. The institute has not only steadily advanced in terms of infrastructure but also specialized itself as a major nucleus for research on forestry and ecology related problems of tropical forests of the central region comprising of the states of Madhya Pradesh, Chhattisgarh, Maharashtra and Orissa. 1. To undertake research on silviculture and management in tropical forests and agroforestry models for livelihood support. 3. To undertake biodiversity and ecological assessments for development of site specific conservation strategies, including climate change mitigation and adaptation issues in tropical ecosystems. 4. To undertake research on conservation and genetic improvement of commercially important tree species of tropical forests for productivity enhancement. 5. To undertake and promote forestry research, education and extension, leading to scientific and sustainable management of forests, with special focus on tropical and deciduous forests. 6. To provide technical assistance and material support to states, forest dependent communities, forest based industries, tree & NTFP growers and other stakeholders in their forestry based programmes for conservation and sustainable use of forest resources. 7. To develop appropriate cultivation, harvest and post- harvest techniques for important NTFP and lesser known tree species. Two varieties of Rauvolfia serpentina (Sarpgandha) were released as improved varieties in terms of high reserpine content, root yield and total alkaloid. The variety named as TFRI-RS 1 reported to contain high root yield (28.53 g) whereas TFRI-RS 2 reported to contain high alkaloid (3.81%) and reserpine (0.09%) as compared to check varieties viz, RS-1(JNKVV, Indore) and CIM-Sheel (CIMAP, Lucknow). Both the varieties are suitable for cultivation in central India for higher economic returns and supply of authenticated planting material can be ensured. Filed patent No.201621007000 on “An adhesive formulation comprising defatted Shorea robusta (Sal) seeds”. Starch –tannin composition from defatted Sal seed cake with or without unmodified starch. The bioadhesive is non-toxic and ecofriendly, has potential application for indoor wood-wood and paper work. 2) Filed patent No.201621006994 on ‘Pesticidal formulation based on surfactants from non edible oil seeds”. The pesticidal formulations prepared from non-edible oil seeds surfactants without any emulsifier and preservatives and has potential application on various agricultural and forest pests. 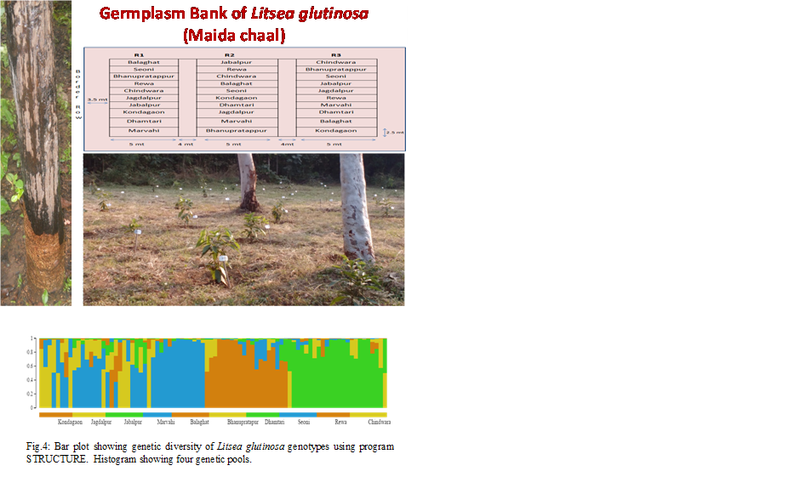 The bark of L. glutinosa constitutes the common demulcent drug sold in Indian market under the trade name Maida Lakri. It is also used in Agarbatti making industry, which consumes almost the entire production of the bark. Due to increase in demand, the trees are extensively damaged by unsustainable extraction of bark. At T.F.R.I. Jabalpur, germplasm from the ten different forest divisions of Madhya Pradesh and Chhattisgarh was collected and established as a germplasm bank and has great conservation value by being useful for further multiplication/evaluation and ex-situ conservation of the species. Molecular characterization of this germplasm assemblage was also carried out and its STRUCTURE analysis revealed four genetic clusters of this critically endangered species. A study was conducted to standardize non destructive harvesting technique of oleo-gum resin of Commiphora wightii (Guggul). 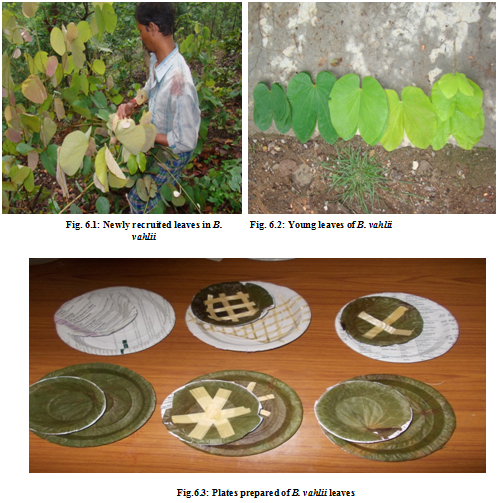 Experiments were conducted at Piprai (Morena) and Kankura (Bhind) in Madhya Pradesh using different types of incision (Guggul blazer, borer, chisel) in different girth size (10-20, 21-30, 31-40 cm) of plants. Maximum quantity of oleo gum resin was observed in multiple slant cuts by Guggul blazer. The non-destructive harvesting method developed under the project is of great value in the sustainable management of Guggul. TFRI, Jabalpur has standardized sustainable (non-destructive) harvesting practices of Mahul leaves in tribal belt of central India, including Achanakmar–Amarkantak biosphere reserve. It has been concluded that harvesting intensities, 50-60% is found superior for getting quality as well as progressive recruitment of leaves in natural forest areas. It is suggested that harvesting should be restricted to twice (June and October) in a year without damaging the climbers. 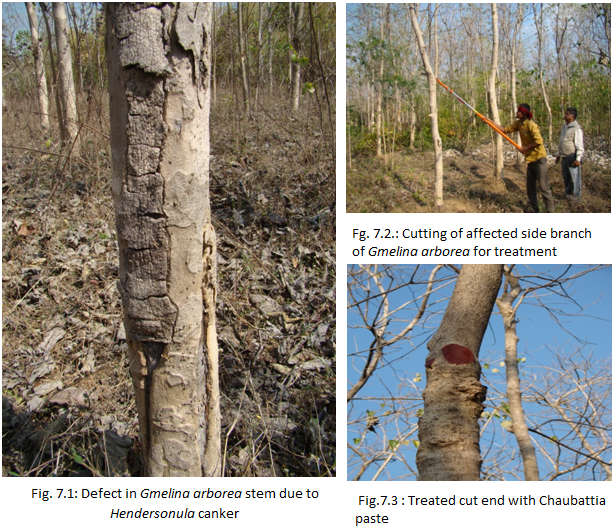 Disease and insects are found to be the causes of substantial mortality in Gmelina arborea plantations. TFRI studied plantations in MP and CG which showed that only 16.5% trees were healthy while rest 83.5% trees were infested to different degrees (40.4% trees showed low infestation, 30.1% medium and 13.0% showed heavy infestation). The pest and disease complex comprising 8 insects and 8 fungi were found associated with mortality of Khamer. Field experiments were conducted for management of Gmelina mortality. Treatments applied in these experiments include fungicide (Ridomil 0.2%) and insecticide (Monocrotophos 0.05%) along with nutrient management. Mulching followed by application of vermicompost along with Ridomil and Monocrotophos treatments were found to be effective. In standing trees branches showing die back due to disease/insect attack or physical damage were cut and the cut ends were painted with modified Chaubattia paste which prevented any further fungal invasion and insect attacks. In order to improve the quality of plantation, it is necessary to ensure the use of good quality seed of known progeny from seed orchards, seed production areas etc. Field experiments using biopesticides (Bacillus amyloliquifaciens and Bacillus thuringiensis), Insecticide (Monocrotophos), Fungicide (Bavistin), Trace element (Rellistracel) and growth hormone (Planofix) in different combinations were applied in 16 year old TSO at Nanditola, Seoni MP. 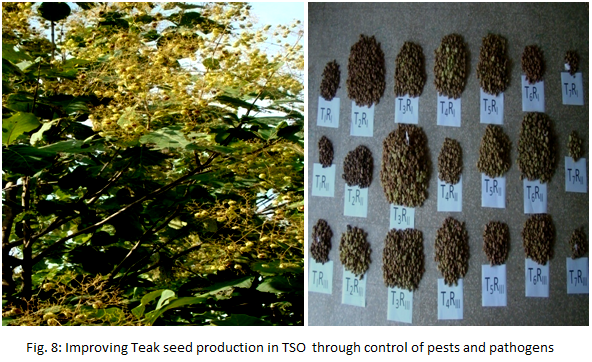 Results of the experiment showed maximum number of fruits and weight of teak seeds in treatment (T3RII ) of Monocrotophos 0.05% + Bavistin 0.02%. The fungal flora and insects were also found less in this treatment. 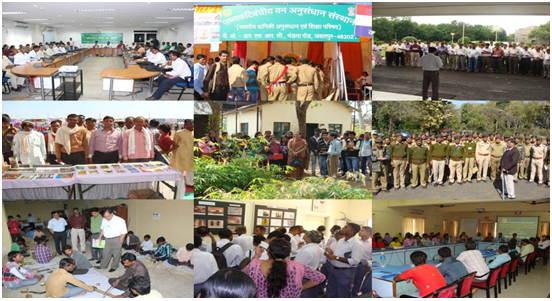 The extension division in the institute is an interface between the institute and the stakeholders' like, State Forest Departments, Forest Corporations, farmers, industries, civil society for dissemination and demonstration of information and technologies developed at the institute and environmental awareness generation. It organizes seminars, training courses and exhibitions on different occasions besides publishing extension material. The division also conducts visits of various stakeholders and maintains a Forest Interpretation Centre and Museum in the institute. The institute has been carrying out the extension activities through four Van Vigyan Kendras (VVKs), one in each state under jurisdiction, i.e., at Raipur (Chhattisgarh), Jabalpur (in Madhya Pradesh), Jalna (in Maharashtra) and Koraput (in Odisha) and other extension programmes in the institute. It is through sponsored and paid Short-Term training programmes. In all, 228 training programmes have been organized by the TFRI and CFRHRD. Different batches of Tropical Forest Research Institute. The division has organized 162 Environmental Awareness Programmes/ Visits/ Demonstration Programmes for different groups of visitors/ trainees viz., probationer forest officer, Range Officers, Forest Guards, farmers and Students), aiming at show-casing the ongoing researches and to sensitize about the importance of forests, forestry research and environment. The extension division of the institute has organized 18 Workshops/ Seminars/ Conferences for discussing specific technical issues related to forestry research and their extension to the stakeholders, institute organizes subject-specific and extension workshops/ Seminars/ Conferences, besides attending 13 melas and exhibitions. Under the linkages with Krishi Vigyan Kendras (KVKs) and attended two KVK farmers' programmes at Sakoli, Bhandara and Amarawati (Maharashtra), the representative from the institute took active part by addressing the gathering and distributing extension material published by the institute. Besides the above, institute has also participated in extension programmes organized by Press Information of Bureau, Govt. of Madhya Pradesh at Sihor (M.P.) and Panchayati Raj institution at Madha Banjar under Kundam Vikas Khand and Pipariya mall under Shahpura Vikas Khand in Madhya Pradesh.The institute has established a Forestry Interpretation Centre and Museum for show-casing the institutional researches for sensitizing visitors about forests and environment. This facility is open to the general public to all weekdays. Van Sangyan: The monthly open access e-magazine (http://tfri.icfre.gov.in/VanSangyan/ Van-Vangyan/index.html) is published by the Institute targeting the field forestry professionals and farmers/tree growers with various popular articles covering the practical aspects of forestry. Tropical Forest Research Institute, Jabalpur conducts Ph.D. programs and other courses in forestry and allied fields to the students of different Universities/ Colleges located in Madhya Pradesh. Students regularly come for their B.Sc., M.Sc. dissertations works and to receive short and long term research training in different fields of forestry. For Ph.D. programs in forestry and other allied subjects, students are being registered every year from FRI Deemed University and R.D. University, Jabalpur. From the beginning 56 students received Ph.D. degree from FRIDU, Dehradun and 23 students from other Universities. From the last two years two students received their Ph.D. degree and other three are submitted their theses.